Attinelli, Emmanuel Joseph Jr., (1832-1895), his known addresses are as follows : in 1834: 27 Stone Street, New York; in 1865: 107 East 49th Street, New York; in 1880, 118 Rail Road Avenue, New York City, New York; from 1886 to 1890, Residence : 137 Centre St., and Doctor's Home Office : 1636 Rail Road Avenue, New York City, New York; in 1893, 1636 Vanderbilt Avenue, East, New York; in 1894, Landis Avenue, Vineland, New Jersey. He was born on April 16, 1832, in New York City, New York, the son of an immigrant Italian nobleman Dot. Emanuel Giuseppe Attinelli, Sr. (January 5, 1803- June 24, 1854), and his mother an American blueblood and native of the state of New Hampshire, Mehitable Kent (November 1, 1796 –July 16,1849). His father, Signor Dottore Emanuel Giuseppe Attinelli, was an illustrious Italian noble who served at the court of King Ferdinand I at Palermo, Sicily. He was forced into political exile in 1821 and came to reside first at Boston and then to 27 Stone Street, New York, working as an exchange or money broker at 8 Broad Street. On March 23, 1821 Metternich sent troops into Naples to guarantee the King of Naples new constitution from dissidents from the Island of Sicily who sought separation and independence from the Bourbon rule of the Two Sicilies. Attinelli, Sr., in a brilliant political maneuver kept his authority as a diplomat to negotiate economic and political relations with the government of the Kingdom of the Two Sicilies (Regno delle Due Sicilie) and the United States. Between 1840-1848/9 young Attinelli Junior was probably educated abroad as the majority of aristocrats had been, typically at Paris, France. So far no documentation has surfaced to corroborate this, but it is consistent with what we would expect to find to be the case. If this were the case in fact the family would have returned to America after his education was completed by 1849. By April 1849 Attinelli, Sr., was appointed the Consul in New York by the government of the Kingdom of the Two Sicilies (Regno delle Due Sicilie), the arrival back to America might also help to better explain this sequence. Evidently, the Attinelli's were a distinguished family of the Italian nobility who were highly cultivated and financially and politically connected and were well suited as part of the Italian Consulate in New York City, New York and Palermo, Italy, which must have afforded them many opportunities to travel especially between these two countries over the years. Mehitable Kent Attinelli, the mother of our character, died three months later of the epidemic in New York in July 1849. He death notice appeared in Spectator, Thursday, July 19, 1849. Her tragic and untimely death appears to have effected the teenager lifelong inspiring him to study microscopy and perhaps inspiring him to enter into the medical profession to fight disease. We can also see how his father's dealings with currency exchange also influenced his lifelong pursuit in numismatics with interest in American and foreign specie. His father continued to work in New York City as an exchange broker, interpreter, translator and Consul to Palermo, Sicily and established many diplomatic relations among the consuls of other governments. He also produced two Italian-English librettos for the New York Opera House, one in 1834, for Puccini's opera Gli Arabi nelle Gallie; and the second in 1845, Rossini's opera Semiramide. His father died nine years after the last opera opened. Young Attinelli was left an orphan at age twenty-two with two uncles, Joseph and Francis-Michael, and no known contacts of the Kent family. Both parents died young at ages 52 and 51 respectively. This was the family life and background of our character for which this brief sketch hopes to flesh out something of his personality so that he might become better understood and appreciated. Attinelli was from a solid family with all the best social and financial connections affording him a privileged life. Perhaps he did not conform to the classic mold of the American elite engaging in behavior which disguises his nobility, but that is part and parcel of his eccentricity – an eccentricity that was allowed and perhaps encouraged by his parents. Since he had no financial need and was not carrying on an established family business he was given a bit more latitude in pursuing his education. One would naturally assume someone of his social class would have gone directly to either Harvard Medical College or to that at Columbia and completed his degree before moving on to other areas of interest. But, Attinelli was not an American blueblood but a Sicilian-American, the first generation offspring of an Italian immigrant and subject to an array of other cultural influences not in the repertoire of bluestocking Americans. He was certainly highly intelligent, trained in science, a gifted physician, a man who could work at the United States Customs Office, aid as an Italian and French translator, and appraise imported cargo for tariffs, while at the same time a serious student of coins and American bibliography and antiques and antiquities. He was indeed a Renaissance man fascinated with the world and everything in it. He was given the leeway, freedom and license to pursue his interests and enjoy life to its fullest, and that he did. Young Attinelli seems to have been involved in studying coins from his youth and like most educated men learned about ancient Greek and Roman coins through his studies of the classical languages. He also was aware of the changes in American coinage as it affected what circulated as species. After the "gold rush" of 1849 a new craze for gold filled the American atmosphere. After his schooling he traveled and his freedom as an independent bachelor granted the leeway to explore and develop in the same vein as his parents granted him leeway to grow and develop from his youth. At some date, perhaps, prior to his father's death young Attinelli travelled to San Andreas, Calaveras County, California, on some unknown account, and suffered the loss of $500 during the fire there in June 1858. The reason why he seems to have been there prior to June 1854 is because his father's death notice in the New York newspaper, Weekly Herald, read "California papers please copy." San Andreas at that time was a mining camp settled in 1848 by Mexicans. Italians were immigrating there circa 1858. In 1850, the Italian population of California numbered 15,495. The 1890 Census says there were 452 people living in San Andreas, California. What portion of the small population of San Andreas in the 1850's was Italian must have been few. It is not clear why young Attinelli went there, if it was concerning gold prospecting, or involving family, friends, or relatives immigrating there from Italy. Two years later he married Lydia Beekman Moulton (d. 1900), the only daughter of Hon. Severn D. Moulton (1806-1878), Tax Commissioner of New York City, on his twenty-eighth birthday, Monday, April 16, 1860 at New York City. The fact that Attinelli married the daughter from an upper class and illustrious family confirms his own financial status as well-to-do, culturally and intellectually developed and a perfect fit to schmooze with affluent and upper crusts of society, like himself. They were married by the Rev. Charles M. Jamison. He and his wife were living in both Boston and New York City as many well to do people had done similarly, apparently with residences established by his father on his arrival to America. In January 1863 "while passing from the Historical Rooms to Twelfth Street, thence to a fancy store in Third Avenue, between Twelfth and Thirteenth Streets, thence through Thirteenth Street to and up Fourth Avenue to Twenty-Fifth Street, thence to and up Livingston Avenue: he and his wife somehow lost her "dark mink muff" traveling about New York City. He published a notice and reward in the New York Herald asking the finder to return the mink to "J.A. Levy's at 31 Nassau Street", a nearby neighbor of Henry H. Leeds at 23 Nassau Street. From 1867-1870 he was appointed to the Board of Aldermen City of Boston, during the administration of Mayor Nathaniel Shurtleff. Married Attinelli still retained the dignity and status of the Consulate in New York since his wife was formally invited to the French Consulate, as published inCourier des Etats-Unis, Sunday, October 5, 1879. This comes as no surprise since he intimates a deep personal friendship and knowledge of Louis Borg, the French Consul in New York when he discusses his auction of medals at Henry H. Leeds & Miner, New York on November 12,1867 and the keen knowledge they had been offered on April 17, 1856 but were withdrawn as he astutely and meticulously recorded these facts in Numisgraphics. This opens the question of young Attinelli having known Louis Borg as a Consul during his father's time when he was Consul, and if this friendship goes back to the speculated period of young Attinelli's early education abroad at France. Like his father before him, in 1865, he is listed as an exchange or money broker at 31 Nassau Street, opposite the Post Office, New York City, New York, in the same office building as the Manhattan Life Insurance Company of New York. He apparently was working with the exchange broker Joseph A Levy since 1863 since he left that name and address as the site to leave his wife's mink muff if found. We are not sure if the mink muff was ever returned since Attinelli left Levy as the recipient about the same time he was arrested for being a money swindler. The whole affair was cleared up when Levy reported he received five one hundred dollar New Orleans bank notes to purchase at 87 cents on the dollar and sold them at 90 cents on the dollar to Arthur & Co., who in turn sold them for 95 cents on the dollar to H. F. Miller of the firm P.C. & Wm. B. Baker. Miller arriving in New Orleans discovered they were old notes drawn on the former Bank of New Orleans now cancelled and were entirely worthless. Levy was the victim of fraud having exchanged the notes in good faith from someone he knew during the Civil War who had brought them from Baton Rouge, New Orleans. According to the New Orleans bank officials the notes were very cleverly and ingeniously repaired by the most delicate and imperceptible tissue paper pasted over the cross cuts that were virtually undetectable even to the trained eye since they had been cross-cut on each of the four corners and across the face by the bank canceling hammer. In June 1872 he began working in the Custom House of New York as the Impost Withdrawal Clerk at an annual salary of $1,500, though he was actively engaged in the medical field in New York City working among the Italian immigrant population. The New York state laws changed the structure on medical licensure that year taking the power from the county boards and placing the authority exclusively with the state board forcing him to find employment outside the hospital. He was a correspondent with the Essex Institute in December 1874. From 1872-1878 he served on the Board of Aldermen for the City of New York. On November 21,1863, he sold his collection of 148 lots of foreign coins, United States coins, medals and tokens and Colonial coins through Henry H. Leeds & Co., New York. He added another 4 lots of United States to another Henry H. Leeds & Co., coin auction held four days later on November 25, 1863. And yet another of 117 lots of foreign and United States coins and medals sold by H. H. Leeds & Co., NY on December 24, 1863. He sold his collection of 384 lots through Bangs, Merwin & Co., NY on December 21, 1864, postponed since December 16. He also sold coins to Charles Wild. In March 1869 he purchased Lord Baltimore coinage paying $21 for several pieces. John Weston Adams has rightly characterized Attinelli’s earlier stabs at coin dealership as “a vest-pocket dealership.” The coins he sold off at auction were the ones he wished to dispose of probably keeping the better specimens for his personal cabinet. He was apparently no more than a dabbler in coin sales and did not pursue it as his contemporary Dr. George F. Heath had done a decade after him. Attinelli, the late nineteenth century bibliophile and American historian left his mark in history providing us with a window into the past allowing us to better appreciate his world of the now numismatic past. But Attinelli was just that, a bibliophile and American historian more than a serious collector of coins or dilettante dealer, part-time or otherwise. Attinelli seems to have occupied his career as a practicing physician in New York catering to the Italian immigration populace in the New York City where he was instrumental in establishing improved medical facilities and providing interpreters for Italian immigrants in need of medical assistance. It is popularly published that Dr. Emmanuel Joseph Attinelli (1832-1895), undertook the task of enumerating every known American coin auction sale to the end of 1875 in his publication of Numisgraphics, or A List of Catalogues, in which Occur Coins or Medals, which have been Sold by Auction in the United States . . . (New York, 1876) [Clain-Stefanelli 11863, Sigler 141] . What is not popularly known is that technically, Numisgraphics is a co-authored work by Attinelli and Parish in light of the fact that Daniel Parish, Jr. provided the bulk of the entries from pages 5-44. The title page reads “Compiled by E. J. Attinelli” with no reference to Parish or mention of being assisted by him or the fact that more than half the auction catalogues listed in his work are based on Parish’s work previously published a decade earlier in a series of three articles in The American Journal of Numismatics. Certainly, Attinelli was not a plagiarist since there is evidence to support the notion that Parish wished to remain anonymous since Attinelli in the Preface references an anonymous person and Parish is the only person living at that time and within the circle of Attinelli's friends who fits the bill. Regardless, he published the book on the occasion of the 1776-1876 Centennial celebrated throughout the United States. The book is an anthology of over 400 listings of coin auction catalogs printed in the United States presented chronologically from 1828 to 1875, with brief notations about the consignor, number of lots, days of the auctions, prices realized, and occasionally personal notes and observations, followed by an index to owners and coin dealers. An appendix contains bibliographic information on books, periodicals, fixed price lists, and institutional collections. Attinelli worked to create a comprehensive and exhaustive list of coin auction sales catalogs and numismatic literature but we know he missed many coin auction catalogs and other numismatic literature as well. He availed himself to reading the ANS organ theAmerican Journal of Numismatics which contained a list published ten years before his own by Daniel Parish, Jr, but did not include four of them. This observation leaves open the question of his methodology and intent and purpose drawing up his manuscript prior to publication. Perhaps he did not pursue tweaking it and polishing it up with further research and hastily published it through peer pressure or other causes that forced him to see the manuscript published or perished. One of these other causes seems to have been the shift in New York state law in 1872 regarding licensure to practice medicine, which he was already actively engaged in. Nevertheless, if he had not published Numisgraphics he would only have been an insignificant footnote in the annals of American numismatic history. Though imperfect and far from complete Attinelli's work still remains a vitally important and basic work that should be in every American numismatists library as an essential reference tool. On September 14, 1876, around the time he published Numisgraphics, he donated bark and wood specimens from several varieties of trees, minerals and fossils, etc., that he collected during his California sojourn in 1858, giving them to the American Museum of Natural History in New York. From this meager donation we see that he was very much the true collector of the period who owned a cabinet of various natural curiosities and other artifacts and rarities in addition to coins. On January 8, 1878, Attinelli published his 36-page catalog of the Charles W. Idell, Jr., collection comprising 978 lots of Ancient Roman and Oriental coins, foreign coins, medals, tokens, and gold, and United States coins, medals, Store Cards, Colonial Coins, and Numismatic Literature. He donated a copy to the Yale Library. His 1878 passport describes him as 5 feet nine inches tall, hazel eyes and chestnut hair. Ah, sell the coins and then travel abroad! That's a great idea! Attinelli was very bright indeed! In March 1882, Edouard Frossard suggested in his periodical, Numisma, that Attinelli should produce a second edition of Numisgraphics with additions and corrections. That message fell on deaf ears. 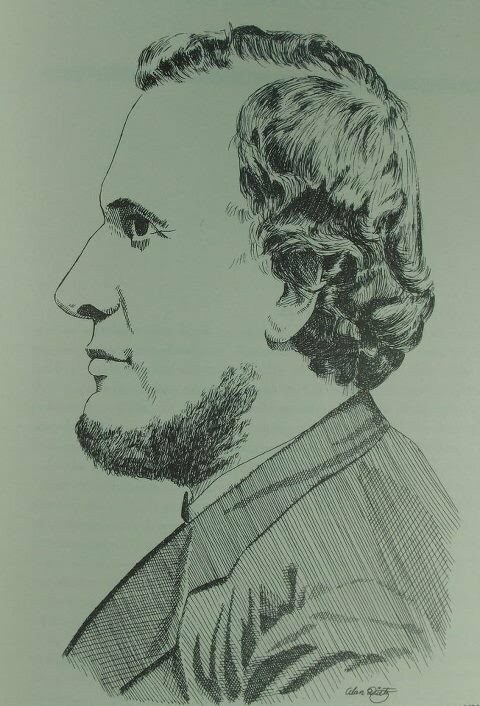 He was a member of the New York County Medical Society, and Surgeon in the Northwest Dispensary. In 1884, he graduated from the New York University Medical College. For much of the 19th century, most states, including New York, did not require medical degrees as prerequisites for practicing medicine. What seems to have prompted the medical degree was the change in New York state law in 1880 when the power of state county medical societies to license was taken away and placed exclusively in the hands of the Board of Regents. Since he had already an established practice among the Italian immigrant population who depended on him he was forced to obtain the degree and pass the state medical exam issed by the Board of Regents in order to continue. After receiving is Medical Degree and state license he was investigated during a trial in which Louis Peroni falsely accused him of poisoning his wife Laura who died on November 29, 1885. In December 1885 the jury found Dr. Attinelli innocent of the charges. On May 19, 1885 he became a life member of the ANS. In 2009 the Numismatic Bibliomania Society conducted a survey of the 100 Greatest Items of United States Numismatic Literature, and Attinelli’s 1876 work, Numisgraphics, or A List of Catalogues, in Which Occur Coins or Medals, Which Have Been Sold by Auction in the United States, Also, A List of Catalogues or Price Lists of Coins, Issued by Dealers, Also, A List of Various Publications of More or Less Interest to Numismatologists, Which Have Been Published in the United States, Compiled by E. J. Attinelli. (New York, 1876) ranked 59th on the list. The History of American Numismatics Series. Purchase the Premiere Publication Beginning With Section One. A Chronicle of Auction History. American Numismatic Auctions To 1875 : 2 Volumes. Each volume $165.00. 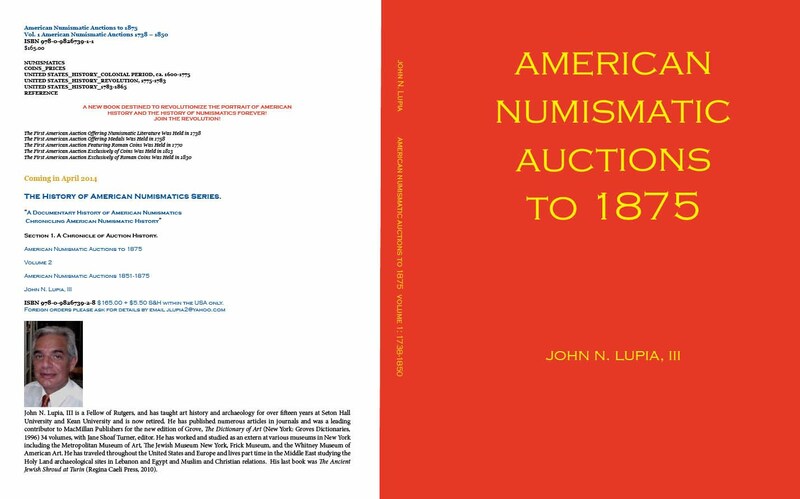 American Numismatic Auctions To 1875 is a revised and expanded edition in two volumes of Part One of Emmanuel Joseph Attinelli's, Numisgraphics (New York, 1876), containing well over 200 auctions not included in the original work. The first volume is in press October 2013 and ready for delivery late November. The second volume will be available in April 2014. Volume 1 : American Numismatic Auctions 1738-1850 (Regina Caeli Press, 2013) ISBN: 978-0-9826739-1-1, takes you on a journey into a specific cultural dimension of American history investigating British colonial North America and Revolutionary War America into the American Republic Era that focuses on the transference of the European curiosity cabinet and museum with its diverse collectibles giving special attention to numismatic collecting. Additionally it is a study on how this cultural activity was part of the market economy and the new rising middle class and documents the earliest known auctions that contained these collectibles especially coins and medals and paper money. Buy a Copy as a Gift for Someone Special or Your Favorite Institution! October buyers please allow 4-6 weeks for delivery; November buyers and thereafter please allow 2-4 weeks. This is a multi-volume series designed by John N. Lupia, III as the American counterpart of the Encyclopedia of British Numismatics. Its original design 20 volumes from the beginning of North American numismatic history in 1513 - 1950. Other sections are in the planning stage to be incorporated into The History of American Numismatics Series with Section Three. American Numismatic Biographies, and Section Four. American Numismatic Literature. 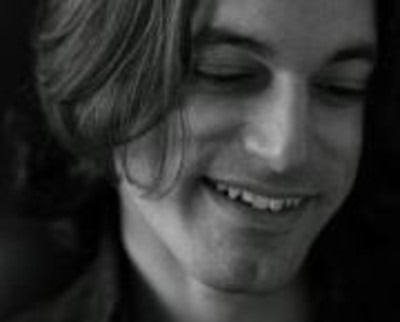 Meet Michael A. Lupia, Regina Caeli Press book editor and designer. Regina Caeli Press is neither affiliated with A. H. Baldwin & Sons Ltd nor with Spink & Son Ltd. The above aforementioned The History of American Numismatics Series A Documentary History of American Numismatics : Chronicling American Numismatic History is exclusively the property of Regina Caeli Press. Section 1. A Chronicle of Auction History. 2 Volumes. Each volume $165.00. The first volume available late October 2013. The second volume early 2014. Learn about their numismatic auction sales beginning in 1738 to 1770. American Numismatic Auctions To 1875 : A Chronicle of American Numismatic History. Auction History. Volume 1. American Numismatic Auctions 1738 – 1850.© ISBN: 978-0-9826739-1-1 $165.00 Late October 2013. "Old Glory" United States of America from 1784 to 1875! Learn about the continuation of numismatic sales in the colonial period to the early American Republic with the first century 1776-1875. Volume One takes you through 1738 to 1850 with a view from British colonial times to the first half of the 19th century in numismatic auction sales. The Two Volume Set of the revised and expanded edition of Part One of E. J. Attinelli's Numisgraphics (New York , 1876), contains a solid individually written and crafted Introduction to each volume providing a substantial setting into which is placed the history of American numismatic sales presented in chronological order. Numerous entries with well over 200 Numismatic auction sales "Not in Attinelli" and Volume 1 with 132 "Not in Attinelli" alone; numerous pages of Numismatic auctions listed from 1738, the earliest period in American history discovered thus far to the end of 1875 in 2 volumes. The first volume to be release late October 2013. Get your copy now! The first volume includes 146 entries. 90 are coin auction sales of which 14 are already in Attinelli. That's 76 coin auction sales not included in Attinelli up to 1850 alone! 40 auctions are of numismatic literature. 15 are non-numismatic auction sales that are of affiliated curiosity cabinet collectibles. Volume One contains 146 entries of which 131 are Numismatic Auctions designated as : 90 coin auction sales; 40 numismatic literature auctions, and 15 entries that are of curiosity cabinet collectibles affiliated with numismatics. Less than 10% of the entries in Volume One, i.e., 14 are found in Attinelli. The lion's share of the book is all new original research revealing the numismatic world of British colonial North America four decades before theDeclaration of Independence and throughout Early America never before seen and brought to you for the first time in this handy volume that will prove to be an invaluable tool. Get ready to be amazed! Join the revolution! With 38 Coin Auctions of 52 Numismatic auction listings (14 are of numismatic literature) "prior to" the famous first entry found on page 5 in Emmanuel Joseph Attinelli's Numisgraphics, listing Benjamin H. Watkins posthumous coin auction sale held at Salem, Massachusetts, on June 12-13, 1828 [No. 61 in Lupia's list, includes 11 numismatically affiliated listings ]. This book introduces a new portrait of the "American numismatic historical landscape" providing the reader with a brief but broader understanding of the development of numismatics and collecting from its earliest roots in England transferred to British Colonial North America. Contemporary American historians cite the Dr. Lewis Roper sale of February 20, 1851 as the beginning of American numismatics. This book will change that point of view forever! Don't wait to hear about it from others but give yourself the empowerment of knowledge firsthand and order yourself a copy today. This book is the missing chapter in American history that sets the story straight for the first time and from hereon in. This book is the First Volume of a two volume revised edition of Part One of Emmanuel Joseph Attinelli’s, Numisgraphics (1876). It covers the period 1738-1850. Its companion "Volume Two" covers the years 1851-1875. The History of American Numismatics Series A Documentary History of American Numismatics : Chronicling American Numismatic History is divided into four sections: 1. A Chronicle of Auction History, 2. A Chronicle of Numismatic History, 3. A Chronicle of Numismatic Biographies, and 4. A Chronicle of Numismatic Literature. This first volume contains a chronologically arranged list of numismatic auctions from 1738-1850. Volume Two will complete the time span given in Attinelli’s Numisgraphics closing at December 1875. Subsequent volumes are planned that continue the chronology to 1950. Moreover, other volumes that document numismatic history in the New World from the Sixteenth-century to 1950 are also intended to form a complete series together with the auction volumes. The first volume takes you into the world of the British colonial collector's curiosity cabinet four decades before American Independence. Find out what numismatic literature the American colonist read about coins from books they bought at auction, and the collectibles they were able to acquire at auction. This first volume takes you on a tour of numismatic auctions from the second quarter of the eighteenth-century to the first half of the nineteenth-century revealing a world heretofore unchartered, unseen, unknown and brought to you for the first time ever in American history. Until now every eighteenth-century auction catalogue having any numismatic content was always found to be European, save one. That exception has been the well celebrated March 10, 1785 auction of the estate of Pierre Eugène Du Simitière (1737-1784), a Swiss engraver working in Philadelphia. America always seemed to have been left out in the cold and into the dark while numismatic auctions were an ongoing business in the Old World, the European world and market. That static old portrait of colonial America and early America is shattered by this new book which paints an altogether different portrait of eighteenth and early nineteenth-century America. · Don't miss out on this absolutely essential groundbreaking reference book for every numismatic library as well as an essential reference tool for all American historians and students. · An indispensable reference tool for scholars and researchers especially for catalogers and those researching provenance of various specimens and types as well as numismatic literature. Ideal for bookseller and librarians. · An indispensable source for American colonial coin history especially Washingtoniana and English Masonic medals and American curiosity cabinets filled with ancient Greek and Roman, foreign and American coins. A NEW BOOK THAT IS DESTINED TO ABSOLUTELY REVOLUTIONIZE THE PORTRAIT OF AMERICAN HISTORY AND THE HISTORY OF AMERICAN NUMISMATICS FOREVER! First printing is a short run of 100 copies. If the market so demands a second printing will ensue after the first printing is exhausted. ISBN: 978-0-9826739-2-8 $165.00 + $5.50 S&H within the USA only. Daily Globe, Monday, June 7, 1858. New York Herald, Wednesday, January 23, 1889. "Miss Tessie Attinelli"
Gengerke, Martin, American Numismatic Auctions, 8th edition (1990) : 10. Adams, United States Numismatic Literature. Volume 1 : Nineteenth Century Auction Catalogs, xi, xiii, 20, 21, 36, 37, 43, 49, 148, 150. ibid., No. 30, page 2; Karl Moulton, “American Nineteenth Century Catalogue Census,” The Asylum, Vol. 23, No. 1, Winter (2005) : 6. Adams, United States Numismatic Literature. Volume 1 : Nineteenth Century Auction Catalogs, xi, xiii, 20, 21, 36, 37, 43, 49, 148, 150, rates auction B-. Gengerke, Martin, American Numismatic Auctions, 8th edition (1990) : 10.